Why is rental criteria important? Should I document my rental criteria in my Rent Perfect account? Having the proper criteria for your rental properties makes all of the difference. Setting criteria will help you stay compliant with Fair Housing Laws, help keep the application process a business relationship, and will assist you in keeping track of what kind of applicants are being approved versus those being denied approval. 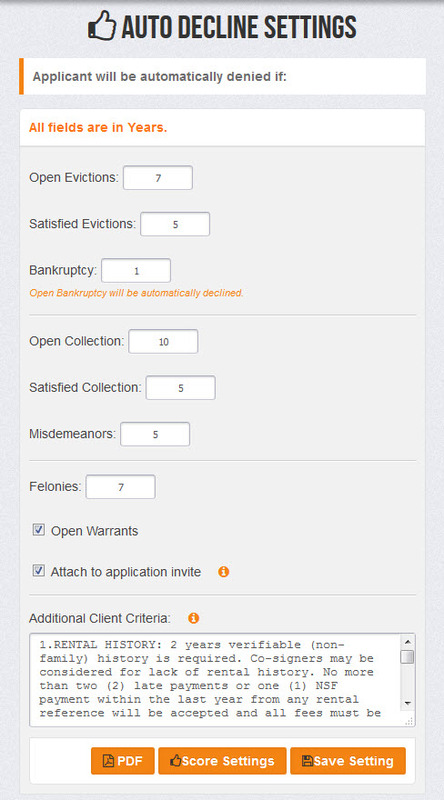 Our system will generate a recommendation based on the criteria in regards to credit scores, criminal, and eviction records for each application. The system is set with default criteria that many landlords choose to use; however, we know that many landlords require criteria customized for their own needs. You may change the default criteria for your account by clicking "Rental Criteria" on the home page. You can manage your credit score criteria first, then click "auto decline settings" to manage criteria for criminal and eviction records. Use the "Additional Criteria" box to document any additional property criteria of your own. What credit scores are you willing to accept? 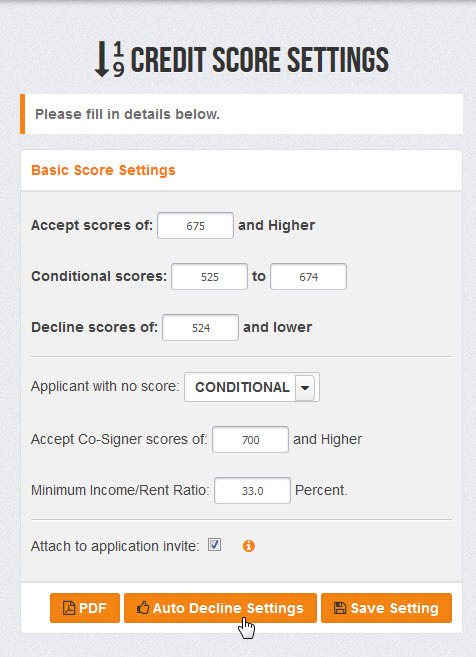 What conditional credit scores are you willing to consider with extra deposit? Are you willing to accept a cosigner? What is the lowest credit score you are willing to accept? Will you rent to someone with a previous eviction? How about criminal records? How many years back? When you hand the keys over to your tenant, you want to do all you can to ensure it is a person you can trust to take care of YOUR investment. Will they cause problems at your property? Are they likely to bring others onto your property that could cause damage or harm? Will they be a reliable, good tenant? Please keep all these things in mind when you are setting your rental criteria.